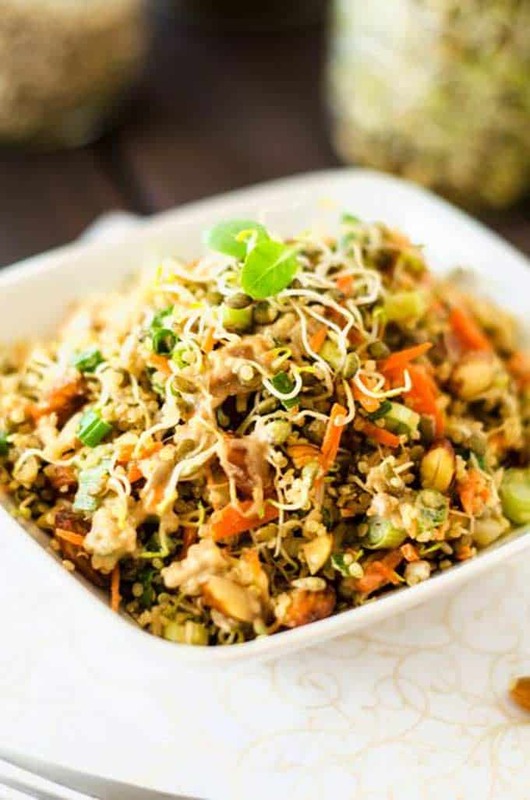 This Crunchy Quinoa Salad is loaded with texture and flavor. This vegan salad recipe is one the whole family will love. Delicious and Nutritious! Note: Crunchy Quinoa Salad was originally posted in January 2013, less than three months before Skye was born. This post was updated July 2017 but the story made me laugh so I decided not to change the content. It is really fun to look back. Apparently, I’m looking hot these days. According to the boys – who are obsessed with all things Angry Birds – my stomach is looking exactly like Orange Bird Blown Up. (2017 Update: Mercifully, Amazon no longer carries this so I can’t show you what my precious boys thought of me when I was pregnant. )As exciting as this may be to the six and eight-year-old set, I’m not even mildly amused. As exciting as this may be to the six and eight-year-old set, I’m not even mildly amused. While downing his second glass of my Third Trimester Tea, hubby tries to comfort me by saying “It’s all baby”. 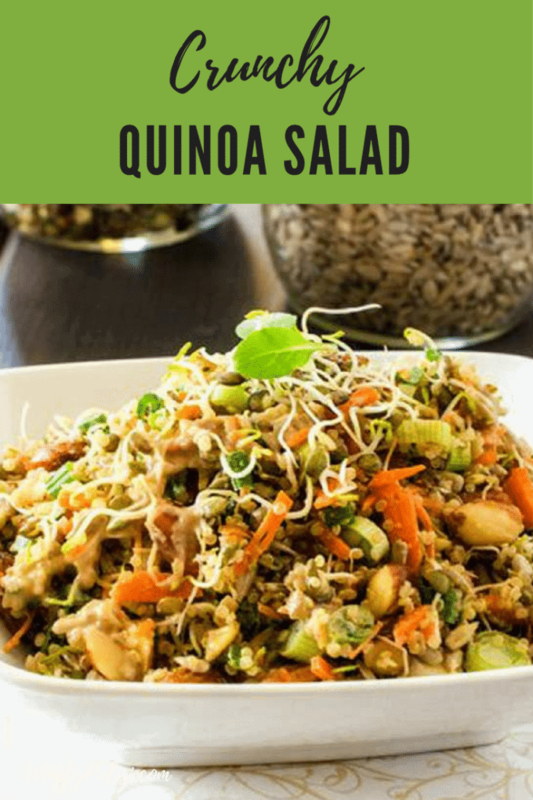 While I mull this over, I’ve got a great quinoa salad to share with you today. I used lentil sprouts here, but really any sprouts will work. I do like the crunchy factor the lentil sprouts add. If you want to give it a try here is how to sprout lentils, otherwise feel free to use whatever sprouts you can find at your grocery store. In a blender combine balsamic vinegar, red wine vinegar, lemon juice, tahini, olive oil, salt, and pepper. Process until smooth. 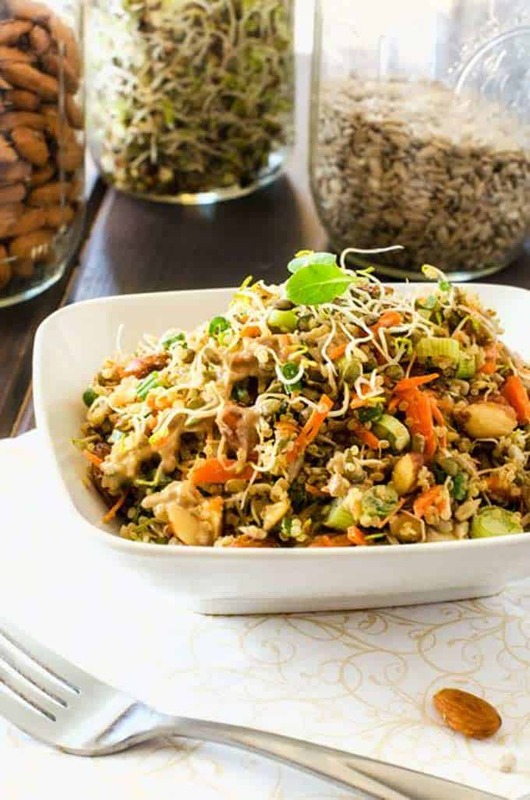 In a large bowl combine quinoa, sprouts, carrot, scallions, sunflower seeds, and almonds. Toss with dressing and season to taste with salt and pepper. 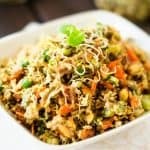 Can the crunchy quinoa salad be used for the Fast Metabolism diet? I found it on pinterest on a phase three FMD page…thanks! I am not familiar with that plan, sorry! I go through different phases and quinoa was one of them. I will try this recipe during my next quinoa phase. This dish looks like it is one my kids would like. That looks so good! I love all the flavors and textures, and I LOVE all the health benefits. Tasty and totally full of deliciousness! I eat a primarily plant based diet and quinoa plays a very important role in my protein intake, so learning new ways to cook and enjoy it is always appreciated. I love a good salad recipe. The most important part of any recipe to me is the taste. With all the different textures, this one is going to taste awesome. I’m really liking the sound of those almonds and sunflower seeds mixed in with the veggies and quinoa. This sounds like a really good meal. Love quinoa and my recipes have been so repetitive lately that I’ve been loosing interest. This looks SO GOOD! I wonder how long this salad would last in the fridge. I’m working on preparing meals ahead! I would say three or four days. I just bought everything to make this! It looks like a yummy lunch! I’ve only had Quinoa once and really liked it. This sounds like a yummy salad! I definitely wanna try this out sometime. I tried Quinoa years ago and absolutely hated it. HOWEVER, I found out recently it was cooked WRONG – so I tried it again and LOVE it so much. This type of recipe is PERFECT for my daughtre and I (both vegan) thanks for sharing! I love a little crunch on my salad and this sounds so good! I felt the same way when I was pregnant with my youngest! Kids can be a little mean, lol. I think this recipe is a must try though! It looks so good! Kids are silly, aren’t they? 🙂 The crunchiness appeals to me in the salad. We do enjoy reading about different ways to make quinoa. I just got hungry seeing those salad pics. I love to try Thai Chicken Salad. Am sure my family will love it. Thank you for sharing. Thanks so much. The Thai Salad is definitely a fav. Reading through the ingredient list was enough to convince me to make this salad. I am loving all the different tastes and textures. The sunflower seeds and chopped roasted almonds would really make this salad a winner!